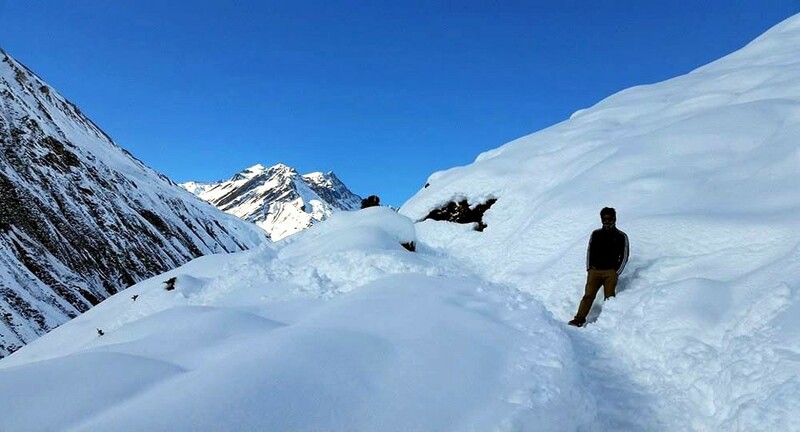 It is the longest and moderately difficult trek in Annapurna area. It starts from Besisahar and ends in Pokhara, a beautiful valley with many lakes and a view of many mountains of the region. The most difficult part of the 20 days long trek is the crossing of Thorung La (5436m). The challenging Thorung la pass, the sacred Muktinath shrine with ever burning flames, old yet beautiful Marpha, Tukuche villages, hot springs at Tatopani and Poonhill panoramic view of mountains and sunrise are the major highlights of this trek. We reach Besi-Sahar from Kathmandu via a 173 km bus ride (6 hrs drive) in local vehicles to commence the trek. To start with, most of the trail is fairly flat until just after Besi-Sahar when the track narrows and the valley becomes a deep river gorge. From Besi-Sahar the trail offers fine views of Hiunchuli and peak 29 (Ngadi Chuli) as it climbs to Bulbule at 825m. It then continues to Ngadi before reaching Bahundanda at 1250m and stay overnight there. From Bahundanda the trail drops steeply to Syange at 1070m. The trail crosses the Marsyangdi River on a suspension bridge and follows the river to the stone village of Jagat. After 45 min. you will be in Chamje and stay a night at Chamje. From Chamje the trail follows the Marsyangdi River steadily uphill to Tal (1675m) a small village at the foot of a large waterfall. Now the trek enters the Manang district. The trail crosses a wide, flat valley before climbing a stone stairway to 1860m. The trail continues with several ups and downs before halting at Dharapani. This section of the trail offers rough and rocky climbing up to Tyanja at 2360m and then continues through pine and fir forest up to Chame (2685m). Here is the headquarters of the Manang district. There are fine views of Annapurna II from Chame. The trail runs through deep forest in a steep and narrow valley, crossing a river on a long bridge at 3040m. Nearing the village of Pisang one has a view of the whole of the Manang Valley, a wide U-shaped Valley between the two huge snow peaks. The trail climbs a steep ridge that extends into the valley. At the top of this spur are excellent views of the Manang Valley, with Tilicho peak (7132m) at it?s head and a view back to Pisang peak: one of the trekking peaks. The trail crosses the Marsyangdi on a large wooden bridge near Mungji at 3360m then traverses to Bryaga, a Tibetan style village consisting of about 200 houses stacked one atop another, each with an open veranda. We spend a day in Manang village to acclimatize and explore Manang. From the village of about 500 flat roofed houses one has excellent views of the Annapurna II, Annapurna III and Gangapurna Lake. The trek now begins an ascent of almost 2000m to Thorung La. Fom Manang village the trail crosses a stream before climbing to Tengi. We then continue to climb the Marsyangdi Valley, passing the small village of Gumsang. After crossing the large stream that flows from Chulu west and Gundang, the trail passes an ancient Mani wall in a pleasant meadow at 4000m. Beyond here is Yak Kharka also known as Koche. After an hour we reach Letdar (4250m). From Letdar the trail continues to climb along the east bank of Jorsang Khola, then descends and crosses the stream on a wooden bridge at 4310m. After making a short ascent on a pleasant trail to a teashop, the route then follows a narrow path across a high scree slope before descending to Thorong Phedi. Phedi, which means Foot of the hill, is a common Nepalese name for any settlement at the bottom of a long climb. The trail becomes steepest immediately after leaving Thorong Phedi, and takes 4 to 6 hrs from Thorong Phedi to the Pass. Thorong La Pass with it? 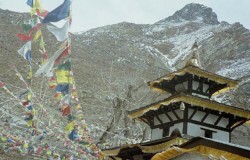 traditional Chorten (prayer flags) is at an elevation of 5416m. The views from the trail and from the Pass itself are of outstanding high Himalayan scenery. One can see to the south the entire Annapurna range, a heavily glaciated peak, the barren Kaligandaki Valley far below to the west and the peak of Thorungtse (6482m) to the north. The trail descends to Muktinath from here. The trail descends very quickly to the valley floor. The descent is through a dramatic, arid landscape all the way to Kagbeni. To reach Kagbeni one must travel on either side of the Kaligandaki River. The left fork continues up the river to Kagbeni. Cross the Kaligandaki and climb steeply up to the Magar Village of Shikha for Launch, after which the trail ascends to Shikha. Walking duration is approximately 4 hrs. The guide will wake you up early for the 2 hr walk up to Poonhill, where on may witness the sunrise for a lifetime memory. Over 30 snow-capped peaks of the whole Annapurna range can be seen from here. This area is one of the finest and most famous trekking areas of Nepal. The Annapurna ranges and Macchapuchre (Fishtail) dominate the mountain views through glimpses farther east of Lamjung Himal and the Manaslu range. The trail descends through huge boulders into the maze of tracks around Ghandruk at 1940m. During the descent to Pokhara, via Birethanti, one can see mules loaded with goods in transit. Walking duration is 5 hrs. Walk up to Nayapul (New Bridge) and drive to Pokhara and stay overnight there. You have whole day free for shopping and packing for your final departure. Today, we will drop you to the airport for your final departure. Arrival and departure transportation, Kathmandu/Pokhara/Kathmandu by tourist bus, Pokhara/Nayapul /Pokhara transportation by private vehicle, 3 nights hotel accommodation in Kathmandu, 2 nights hotel in Pokhara, in trekking food ( breakfast, lunch and dinner ) with accommodation , trekking permits, TIMS , guide, porters, their food, salary and insurance. Personal insurance, rescue flight, personal expenses such as bar bill, tips,, any loss arising due to unforeseen circumstances such as accidents, road blockage due to landslides or strike.